If you missed on the earlier purchase options, Ritz Camera is now also taking pre-orders for the Nikon D800 and Nikon D800E cameras. Amazon is already sold out. 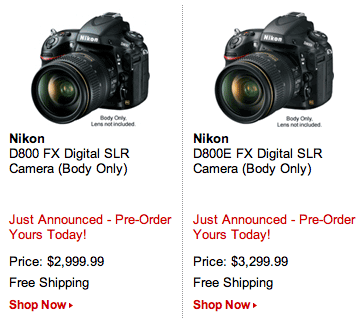 This entry was posted in Nikon D800 and tagged pre-order. Bookmark the permalink. Trackbacks are closed, but you can post a comment.